Trade show technology has evolved greatly from the lone television screen. If you're not incorporating new and trending aspects, you could be hurting your chance as an exhibitor to generate leads. Ready to step into the digital age? Here are some products you should invest in at your next show. If you're new to incorporating technology into your booth design, it will likely seem overwhelming. Products like virtual and augmented reality, holograms and digital signage all require a level of mastery to ensure your trade booth will be successful. It's worth it to devote a portion of your budget to an event technologist. Some forward-thinking installation and dismantle companies have a staff member dedicated to the intricacies of setting up and taking down these products. 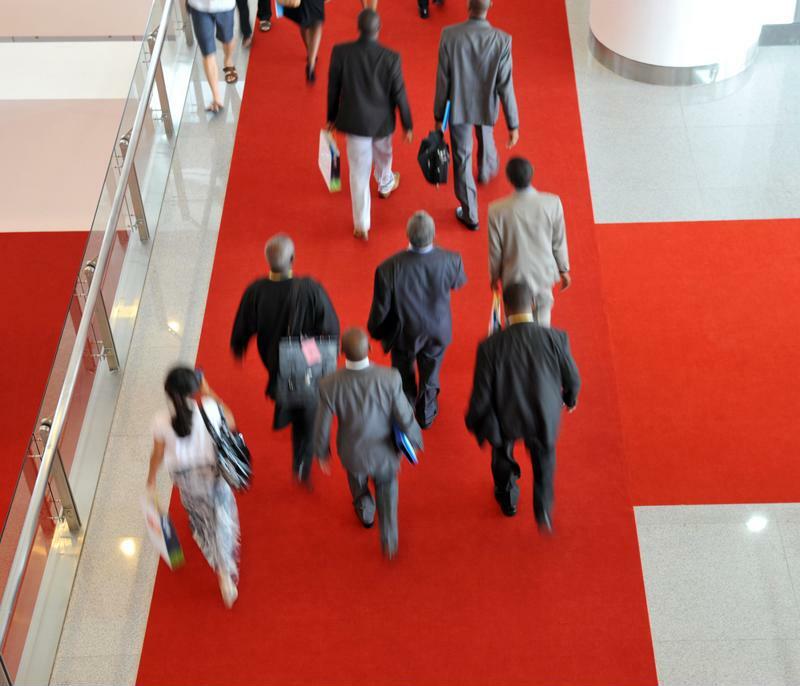 This will ensure your trade show goes on without a hitch. Any amount of downtime could result in a low return on investment, which could affect your future exhibiting budget. Headsets like Oculus Rift, HTE Vive and Samsung Gear have all made virtual reality an affordable possibility for any trade booth. More so than flashy signs, crowds draw attention and create curiosity. Because only one person can wear the headset at a time, your salespeople will have the perfect opportunity to talk to the crowd, speak about the company's product before they check it out and cultivate leads. "VR allows you to showcase products in a different way." According to Godfrey, a business-to-business marketing agency, VR gives your booth the visual product representation it's been missing. For example, take the automotive industry. If your company is selling key, functional parts that are often hidden by the engine, it wouldn't make sense to bring them in alone. Yet, bringing in the entire engine would cost a fortune in drayage alone. Different hardware is useful for certain booths, ZDNet reported. While Google Cardboard is a great product, its design lends itself to wear and tear easily. With hundreds of expected attendees putting it on and pulling it off over the course of the day, it may be best to invest in something sturdy and reliable. VR lets salespeople take the customer on a virtual tour under the hood, in this instance, all while describing exactly how it works and highlighting the value points. This allows for a better selling opportunity at a cheaper price to the exhibitor. More booth visitors, plus less of a cost to exhibit, generates exceptional return on investment. Slightly different from VR, augmented reality allows trade show booths to showcase their products in the venue environment, rather than superimpose one on the viewer. The underlying theory here, though, is similar to what was said before—crowds draw attention, and salespeople can pitch products to people while they're waiting in line. There are two big draws for implementing AR. The first is that as an exhibitor, you'll generate value for your event app. This is because you'll need an interface within an attendee's smartphone where he or she can view the environment as intended. What this does is create a funnel for information between the business and the consumer. Not many companies can boast the fact that every person who listens to their pitch ends up downloading the app. Incorporating AR allows you to cut down on drayage, create more space for salespeople to engage with attendees and ultimately produce more leads through the revamped functionality of your event app. All of this comes at the price of a coding company that can create it, but the potential yield is well worth the investment. Event technology can help create traffic at your booth, which can result in more qualified leads. No, Spock doesn't accompany this technology. What may have once been seen as the stuff of science-fiction is now one of the most eye-catching, albeit expensive, tools in the exhibitor's belt. Having your products displayed by a hologram bridges the gap between curiosity and lead. It makes sense—not everyone wants to wait in line to use a VR headset, but a hologram allows a whole group to view inventory all at once. Hiring an event technologist to help set up your booth is key when using this type of device. Holograms are fairly new, and one small wiring mishap could shut down your entire booth for a day. Holograms allow you to forego bringing inventory to the booth in an effort to make a more visual attraction. Failing to incorporate it properly, though, can cut your ROI down drastically. These three event technologies all help you reduce drayage costs, boost attendee engagement and facilitate better lead conversion. The only question you have left to ask yourself is which one you'll invest in.